Broadcom has announced two additions to their "5G WiFi" products for next-generation IEEE-802.11ac applications, the StrataGX BCM5301x for Small and Medium Business (SMB) routers, and the BCM4708x series for home routers. According to Ed Doe, Product Line Director for the Networking SoC Business at Broadcom, the StrataGX includes a higher performance processor and additional Inputs/Outputs (I/Os), such as the Reduced Gigabit Media Independent Interface (RGMII) for fiber Passive Optical Networks (PON). 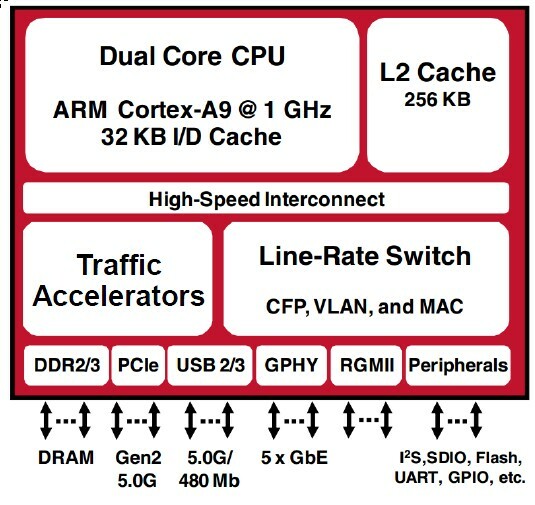 The platform for both product lines is otherwise the same, integrating dual ARM Cortex-A9 cores that operate up to a 1GHz clock rate, with a Gigabit Ethernet (GbE) switch, five GbE I/Os, and support for USB 3.0, in a single 40nm SoC. Doe says that providing all of these functions would have taken as many as five separate chips in previous product generations. Integrating all of the functions in a single chip allows for better overall system power management. Dino Bekis, Broadcom's Senior Director for Access and Wireless Entertainment, says that 802.11ac can also save power over previous generation 802.11n WiFi, by transmitting the same amount of data in a shorter period of time. The internal High-Speed Interconnect in the BCM5301x and BCM4708x implements a 12Gbps pipe, which enables the processor to connect at line rates to the five GBe ports: 1 Wide-Area Network (WAN) and 4 Local Area Network (LAN) I/Os. Special-purpose Traffic Accelerators offload the CPU to handle worst-case date rate loads, and perform packet processing. Parallel processing avoids the potential bottleneck of handling data transmission over the 5Gbps Peripheral Component Interconnect Express (PCIe) Gen-2 interface. Broadcom is expecting the WiFi market to shift from 802.11n, where the majority of use is in the 2.4GHz band today, to dual-mode 802.11n/802.11ac in 2013. The 5GHz band, which 802.11n also supports, is expected to benefit from less congestion and interference. According to Bekis, Broadcom has not seen any issues with in-building propagation of 5GHz WiFi. The design of the Power Amplifiers (PAs) in the router are the biggest factor in determining propagation, he says. He also explains that 5GHz in 802.11ac is different than in 802.11n, with the use of more robust Low-Density Parity-Check (LPDC) error correction and 256 Quadrature Amplitude Modulation (QAM). Though the LDPC code is very similar between 802.11ac and 802.11n, it is optional in both the 11n and 11ac specifications. 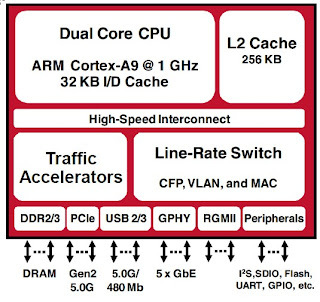 Broadcom claims that LDPC will have a much bigger benefit in 802.11ac, with the higher data rates that are enabled by 256 QAM modulation and wider channel bandwidths (up to 80MHz). Broadcom supports LPDC in all of their 5G WiFi products. Original Equipment Manufacturers (OEMs) and retailers continue to drive the need for minor feature differentiation in order to achieve their price-point targets. Broadcom had previously released the BCM4360 transceiver supporting three spatial streams for send/receive (3 X 3), the BCM4352 (2 X 2), the BCM43526 (2 X 2) with USB 2.0, BCM43526 (1X) with USB 2.0, and the BCM43460 (3 X 3) for enterprise applications. Broadcom explains that in the retail router market, predetermined price points drive features. The "high-end" is 3 X 3 with simultaneous dual-band (2.4GHz/5GHz) operation, necessitating parallel radios, whereas the next step down would be a switchable single radio to support both modes of operation. Prices move down by reducing spatial streams, which reduces coverage range and throughput. By supporting multiple streams, users should be able to wirelessly stream video from multiple sources to multiple devices simultaneously. By upgrading the USB interface to 3.0, for Network-Attached Storage, Broadcom can support higher performance media servers within the home. Broadcom says that the StrataGX BCM5301x and the BCM4708x series are currently available in sample quantities, and the company is planning a production release for the second half of 2012. CES Downloads: Faster and easier WiFi, or just more confusing? CEVA announces new DSP cores with reference architectures for LTE-Advanced, 802.11ac WiFi.